This is Nyx. I've wanted to write about her for a while. It seems a good day to do so. 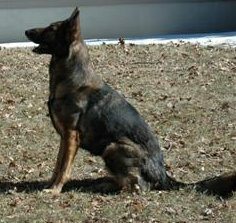 Some might consider it a call of fate that I had a dog named Nyx before I started playing Eve Online. Nyx is seven and I did not start looking into or playing Eve until 2011. I often shy away from her name when it comes to Eve related things because people assume that she is named after the ship in game. Nyx, you see, is named after Nox. And Nox was named after the character in the Incarnations of Immortality series of Piers Anthony. I loved the name. I like x's. That is how Nox got his name and as he grew older and I decided to get Nyx, I had this desire to give them the same name. It was a hand off of sorts. Nox would teach Nyx and in that way he'd stay with me. He was an amazing, amazing dog. I miss his goofy, good natured energy. The goodess, Nox/Nyx fascinated me. Many people assumed that Nox was really Knox after the US Fort. But no, he was named for a goddess with a fascinating name and interesting description. And that is how Nyx, got her name and I got to write an Eve associated post about my dogs. Handsome dogs! My Jack Russell is named Loki...partly after the ship in EVE (which I *can* fly but never have) and partly after its namesake, the God of Mischief :) Fits him well. On A Pale Horse is one of my favorite books! The lead from that book also appears in the annals of EVE...Thanatos!